When comparing frameworks for scaling Agile such as SAFe® (the Scaled Agile Framework) or Scrum at Scale, the question is not what the best framework for scaling Agile is, but rather which framework is best for you. Taking into consideration your particular environment, processes, and goals will help you decide which scaling framework to use. 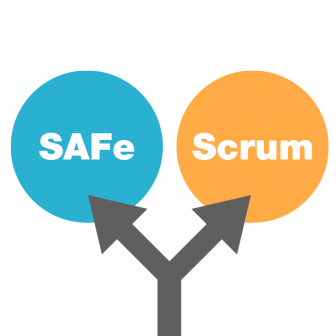 What is the Difference between SAFe and Scrum at Scale? Of the 10 or so distinct frameworks for scaling the Agile methodology, all are based on Scrum to some extent or another (including, of course, Scrum at Scale and SAFe). However only one framework is designed for, mature enough, and sufficiently documented for use at the large enterprise level. The Scaled Agile Framework (SAFe) is by far the most popular framework for scaling Scrum in large organizations. It is also important to note that SAFe is designed to accommodate DevOps, a method increasingly considered a staple for Agile organizations. SAFe is a prescriptive method that outlines a highly structured framework to adopt and operate an Agile value stream in an enterprise setting. It's best for large organizations looking to retain as much organizational and process structure as possible while reaping the benefits of a decentralized Agile way of working. SAFe is not as easily customizable as Scrum at scale, so an in-depth analysis of your value creation processes is crucial to planning an Agile transition process using the Scaled Agile Framework. On-demand webinar: SAFe 4.0: Implementing Enterprise Agile Using the Scaled Agile Framework – with Michael Stump of Scaled Agile Inc.
Scrum at Scale by Dr. Jeff Sutherland and Alex Brown is the newest of all the Agile scaling frameworks, publicly introduced at Agile 2014 in Orlando. It is therefore relatively untested and undocumented when compared to SAFe, making it less suitable for large enterprise adoption. In short, it's a modular approach to scaling the well-known Scrum framework. Scrum at Scale is an extension of the core Scrum framework. What this means, essentially, is that wherever Scrum is used, Scrum at Scale can help scale the framework. Therefore, in theory, it is a great solution for organizations of all sizes. It uses a modular approach to scaling Scrum, the aim of which is to align the entire organization on a shared set of goals. The main argument for a modular approach to scaling Scrum is that no two implementations of Scrum are the same. Therefore, the requirements of the framework for scaling Scrum differ on a case-by-case basis. The modular approach enables developers to only adopt those modules that are necessary in their specific environment, rendering it a better choice for teams working with specialized and highly customized processes or in an untraditional environment. Agile tooling remains a topic of debate. While the Agile methodology explicitly favors a focus on "Individuals and interactions over processes and tools", most experts agree that adequate tooling is in fact an aspect of great importance. Tools that support the adoption and scaling of Scrum or any other Agile method can greatly impact the profitability, efficiency, and satisfaction of teams involved. Agile platforms such as codeBeamer ALM can support the transition process and streamline collaboration, whether you're working with Scrum at Scale or any other Agile method. To learn more, contact us, or start your free trial right away!